The NEW 2014 Next Generation Life Ionizer M-9 UC is a completely new ionizer that replaces Lifes popular 9200 model. The Life M-9 has much larger plates, and an improved power supply that allows it to make alkaline water with much higher antioxidant potential. The New 2016 M9 Series has the New 2016 Heavy-Duty GRID Plate Technology™ with MAX Plate: 8 layers of Platinum over Industrial Titanium. FACT: The Life M-9 has higher total plate surface area than the Enagic SD-501! Benefit to you: Thanks to efficiently designed chambers and 9 large Platinum/Titanium plates the M9 provides the highest ORP at a drinkable alkaline level of any ionizer on the market today. Dual internal filtration with Free water report and customized pre-filter system to provide the purest healthiest water using Life exclusive Vitamin C Ceramic Block® Filter Technology (patent pending) to address chlorine and chloramines! 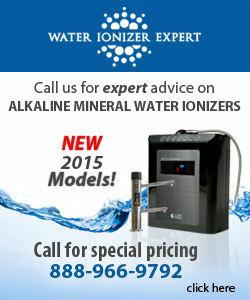 You get more optimized levels of alkaline mineral hydrate water with stronger antioxidant potential! Life’s top-of-the-range M9 once again sets the standard in quality and performance. LIFE exclusive advanced features and technology guarantee your M9 will supply you with years of the highest quality ionized alkaline mineral water. Plus, Peace of Mind 60 Day Money Back Guarantee*. FREE shipping and over $539 in Free Bonuses!